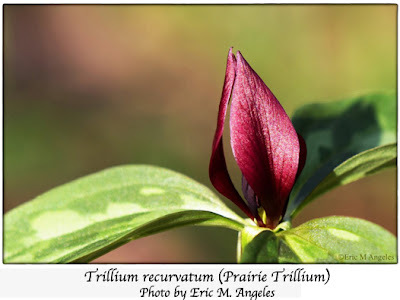 Eric Angeles, one of my Facebook Friends posted this great photo of a Prairie Trillium. So, since I am pretty far from Indiana and I don't think I will find a Prairie Trillium in Georgia, I asked Eric if I could post it here for your enjoyment. Actually according to the USDA maps it is nearby in North Carolina and Alabama and most of the east but, not in South Carolina, Georgia or Florida. It may be rather rare and/or threatened in many states. Interesting, one common name is Bloody Butcher. I may do some research to find out how that came about.